Muay Thai also known as Thai boxing or Thai kickboxing, is a martial art originally from Thailand.Traditional muay Thai has a long history in Thailand as a martial art used by the military. The military style of muay Thai is called Lerdrit, while today’s “sport muay Thai” slightly varies from the original art and uses kicks and punches in a ring and with gloves similar to those used in boxing. Muay Thai is also known as ‘The Science of Eight Limbs’ as the hands, feet, elbows and knees are all used extensively in this art. The basic offensive techniques in muay Thai use hands, elbows, kicks and knees to punch and kick the opponent. To bind the opponent for both offensive and defensive purposes, small amounts of stand-up grappling are used: the clinch. The clinch is applied by holding the opponent either around the neck or around the body. In Western Boxing, the two fighters are separated when they clinch. Defensively, the concept of “wall of defense” is used, in which shoulders, arms and legs are used to hinder the attacker from successfully executing his techniques. Because of the power involved with Muay Thai techniques, fighters do not often block strikes like in other martial arts. Fighters prefer to evade attacks by stepping out of range or moving toward their opponent in order to jam techniques such as kicks. Though the high kicks at the head look spectacular during a competition, insiders of the sport claim that the elbows and the knees are the most damaging, sometimes deadly, to the fighters. 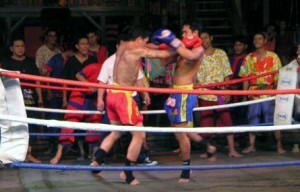 Two muay Thai techniques became popular in other martial arts: The Thai low kick and the Thai roundhouse kick. The low kick uses a circular movement of the entire body to kick the opponent’s leg with the upper part of the shin. When not correctly defended against, this technique often leads to the end of the fight, as the opponent can not stand anymore after a few low-kicks. The Thai roundhouse kick is also unique and was adapted for its efficiency. The kick is carried out with a straight leg and the entire body rotating from the hip, which is “locked” right before the leg makes contact to the opponent. Other martial arts, such as Shotokan Karate tend to prefer “snappy” kicks, which are faster but less powerful. Furthermore, Thai boxers kick with the shin instead of the foot. Almost all techniques in muay Thai use the entire body movement, rotating the hip with each kick, punch and block. This results in most techniques being slower but more powerful than techniques from boxing or karate. The rotation of the hips in Muay Thai techniqes is very distinctive and is what sets Muay Thai apart from other styles. During a competition, the participants perform a lengthy ritual and ceremony before the fight (wai khru ram muay). The ritual is both for religious reasons and as a stretching warmup.